My Dry Bar Comedy special on VidAngel is now available to both VidAngel subscribers as well as anyone who want to trade a dollar for some clean comedy. I’m very happy with my performance and think it’s my best recorded-for-posterity work to date. VidAngel has been serving up excerpts from all its comedy specials on YouTube. Not a bad strategy—those little samples they give you at Costco often lead you to buy the whole package, right? But one comment very much bothered me. The person suggested a piece of my performance, my material, my creativity was stolen from someone else. I know that’s not the case, and anyone who knows me knows that I spend enormous amounts of time writing, editing, and honing my jokes. Still, it’s entirely possible that some of my observations are topics another comic might have weighed in on. I’m not the first guy to ever check into a hotel. At first I was heartbroken. I work so hard on my material! How could anyone think of me as…joke stealer? What I write and what I perform is all me. It’s my brain, my integrity, my reputation. The YouTube commenter accused me of performing a bit similar to Brian Regan, a very successful comedian—with a lot more specials under his belt that I have. Meanwhile, I have performed with Dennis Regan (Brian’s brother) who did not see fit to call the Joke Police. I don’t know which specific joke the person was referring to, but, c’mon, most working comedians fly to gigs. I’ve racked up two million miles on one airline alone. It would be strange if comedians did not poke fun at airlines. Most of my airline material has been years in the making. Portions of that routine go back to a self-produced comedy album which was produced on cassette. I think I still have six cassettes in the garage. I would love to send one to that commenter, but no one has seen a cassette player in years. I’ve always tried to write timeless material so I can make people laugh, then crack up their kids and grandkids years later. No one’s gonna say Mr. Carlin stole anything. He just thought something that other people also thought about and said so. Then Carlinized the concept. Coincidentally, I saw Brian Regan in an episode of “Comedians in Cars Getting Coffee” with Jerry Seinfeld. The two of them talked about having the same premise for a joke—but different deliveries. Whether a joke is stolen from me or I happen to have a bit very similar to that of another comedian, I drop once that material is heard by a large TV audience. That’s one of the best reasons to keep producing new material. I believe that anyone who thinks I lifted a joke is simply not familiar with me. If someone hears two similar jokes, it’s human nature to assume the performer he or she knows is the originator. No comic can know everything that’s happening on every stage, so more than one performer can get big laughs by sharing their funny take on travel (or car repair or kittens or cholesterol). It’s rare for any act to survive by stealing. Now excuse me, I need to go write more material for my next headline special so fans of those comedy “household names” will become fans of mine. 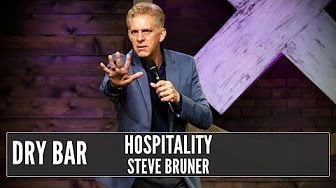 Steve Bruner steal a joke or anything else in his entire life?! Not possible–I’ve personally known this person for over 40 years and it didn’t happen and will never happen. Trust me. I’ve personally witnessed Steve work out jokes at an open mic i run with Paula Johnson. I’ve seen nuggets written on index cards go to gems. Steve has seen me go down burning in flames on my new stuff and given me suggestions. The point is, that I’ve been in the trenches with him and he does the same thing that real comics do… turn an idea into comedy gold. Are there similar premises and jokes? Of course. Is Steve a joke thief? No, he isn’t. If he was, I wouldn’t see him doing 5 minute sets in front of a room of all comedians working his CRAFT.